Oatmeal (porridge) is one of the healthiest, most economical and most versatile breakfast staples. Yes, those little packets of instant oatmeal are quick and convenient, but they’re often loaded with sugar and salt. It’s tempting to buy them because of their ease of preparation. Plus, they often have added flavoring which makes the taste more appealing. Keep in mind you can add your own flavoring to old fashioned or steel-cut oatmeal using fruit, nuts, maple syrup and even peanut butter which is a healthier and less expensive option. 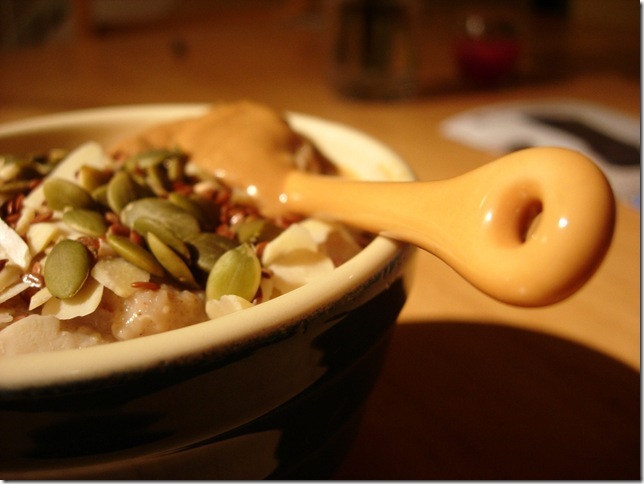 Try this vegan oatmeal recipe for breakfast or even a snack. In glass serving bowl, blend all ingredients except pumpkin seeds. Microwave (high) 2-2 1/2 minutes. I love this recipe, I’m going to try it out. If I would rather not use the microwave, would you say I could heat the soy milk on the stove instead? then add it all in?